If you like art, check out the upcoming Art Goes Alternative show at The Rosewall! The show will feature curated skate decks along with customized dog sculptures with art sales going to benefit Tiny But Mighty. Tiny But Mighty celebrates the unbreakable bond between pups and their people while also raising awareness and some much needed funds for animal welfare and rescue groups. We’ll have a handful of Black 13 artists participating in the show and we’d love to see you there April 3rd 11am to 6pm. Best of all, it’s free! Check out Art Goes Alternative for more info. Zombies, Dancing, OH MY! 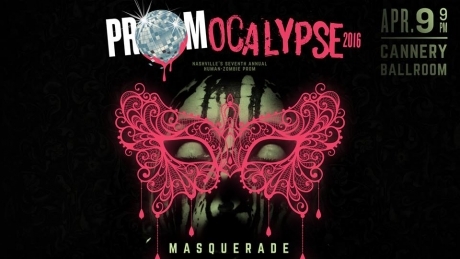 It’s prom season and we’re gearing up for the 7th annual Promocalypse event! For far too long, social events have unfairly excluded Zombiekind. If you are one of the reanimated dead, or are in a relationship with one, there is no reason to hide in the dark any longer! If you are a living human who is sympathetic to the cause of Reanimated Rights, or have ever been Zombie-curious, you are also welcome to join this historic event. For one night, let’s put our differences aside, dance, and have fun! The fun starts at 9pm in Cannery Ballroom! Tickets on sale now! Visit Promocalypse for more info.